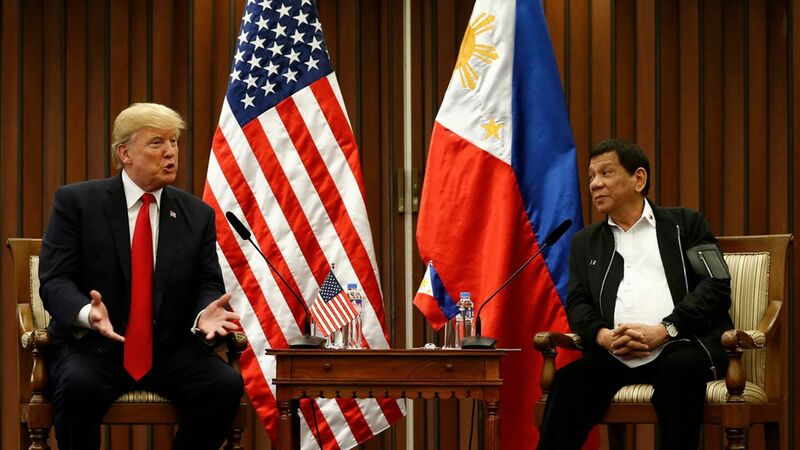 President Trump did not publicly discuss human rights or rebuke Philippine President Rodrigo Duterte's endorsement of extrajudicial killings in The Philippines' drug war during a bilateral meeting at the Association of Southeast Asian Nations summit. What happened: During the public portion of the meeting, Trump and Duterte both ignored repeated questions from the press pool about human rights as Duterte told the pool that the meeting "was not a press statement." Duterte then jokingly called the reporters in the room "spies," eliciting a laugh from Trump. After the meeting, White House Press Secretary Sarah Sanders said that "human rights briefly came up" regarding the drug war, but Duterte's spokesman pushed back on that characterization, telling reporters that human rights was not discussed and Trump "did not have any official position" on the country's drug war. "The conversation focused on ISIS, illegal drugs, and trade. Human rights briefly came up in the context of the Philippines' fight against illegal drugs." "The issue of human rights did not arise. It was not brought up...It was President Duterte who brought up with President Trump the drug menace in the Philippines, and the U.S. president appeared sympathetic and did not have any official position on the matter but was merely nodding his head."